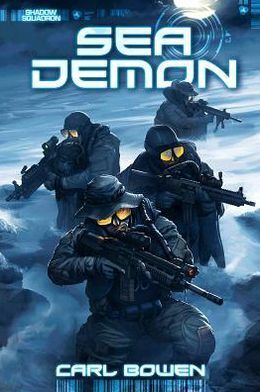 Carl Bowen’s Shadow Squadron is a Tom Clancy type military series written for young readers (third or fourth grade). He keeps the action true to life without the gore (there is killing but it’s the clean shot/clean kill variety – shoot the bad guys, they fall down). His use and understanding of military weapons and nomenclature is good and will appeal to young readers wanting that kind of detail. Wilson Tortosa and Benny Fuentes (drawings and color in that order) provide great, colorful illustrations filled with action and suspense. Shadow Squadron: Sea Devil focuses on Lt. Commander Ryan Cross, the leader of the team and on the team’s first mission, an infiltration into a Somali pirate held ship. Bowen stays inside Cross’s head and gives readers insight into how it feels to be in charge of an operation that could go wrong in a heartbeat. The action is kept concise and compact with no real lulls in the action. There’s a lot of information regarding tactics and hardware, as well as some light history on the current situation in Somalia. The characters are heroic and all portrayed in a good light. This entry was posted on August 4, 2013 at 5:51 am and filed under Adventure,Comics Related,Juvenile,Military Action,series fiction,Suspense,Young Adult. You can follow any responses to this entry through the RSS feed. You can leave a response, or trackback from your own site.